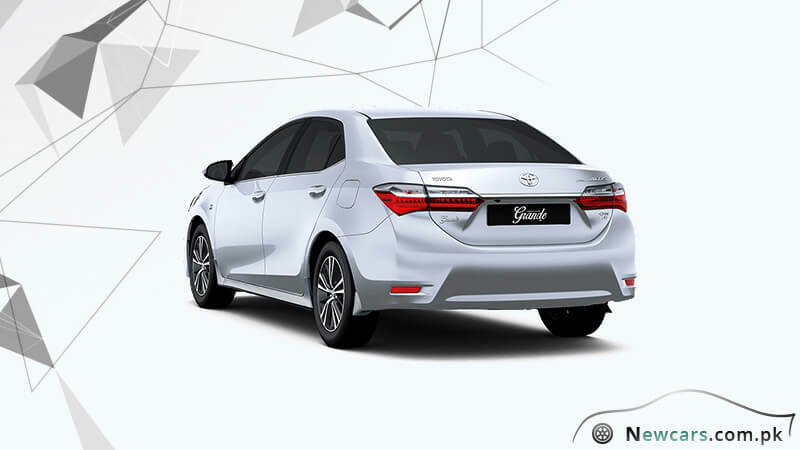 The all-new Toyota Grande 2018 brings exhilarating performance to rev the hearts of the riders and give them a perfectly luxurious travelling experience. The powerful 1798 cc machine can generate the force of 138 horsepower against the 120-horsepower produced by Honda’s City 2018. The car has four variants, viz. 1.8L Altis-MT, 1.8L Altis CVT-i, 1.8L Altis Grande MT, 1.8L Altis Grande CVT-i. 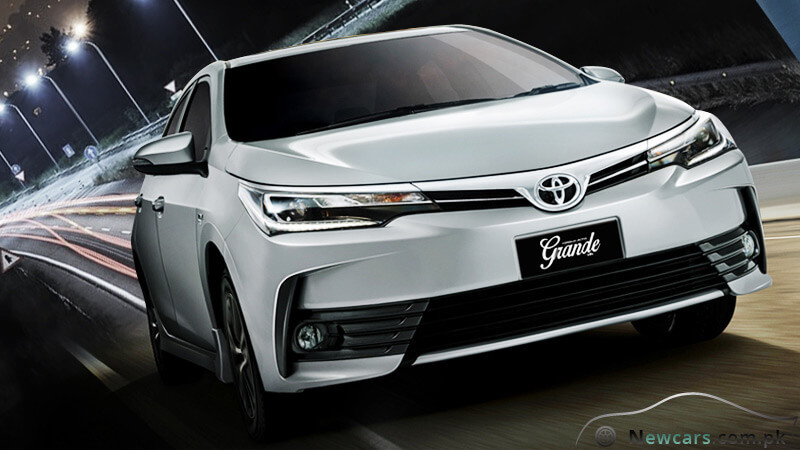 Showing variation in the specs standards, each version carries a different tag for Toyota Grande 2018 price in Pakistan. And the elite class features come forward to justify the price of this luxury four-wheeler in the country. Grande has a utilitarian aerodynamic design that reduces the drag and renders stability to the car at high speeds. The high-speed stability fins of the vehicle are positioned at the wing mirrors and the rear lamps. On the other hand, the advanced cruise control system reduces the driver’s workload through the automatic maintenance of the set speed. The ‘Sports Mode’ of Grande is to satisfy the taste of the sports lovers for enthusiasm. 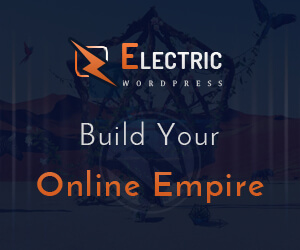 However, here you don’t have to make any compromises for the luxury. In the newly added sports mode, there is alteration in the CVT-i control that renders the vehicle more responsiveness and direct feel. The sporty feel also comes from the Paddle Shift system. Through Paddle Shift mechanism, you can manually control the auto transmission at your fingertips and get a fun-filled sporty feel. There is also an additional Sequential Gear Shift technology. From this, you can get the pleasure of manual mode by manually shifting the standard 7-speed CVT-i. Want to enjoy a seamless automatic shifting facility during the drive? The incredibly impressive 7-speed Sport Sequential Shiftmatic CVT-i is there to provide an optional driving force. In case of luxury vehicles, it seldom happens that the users get a powerful drive without making any compromise for the fuel economy. The all-new Toyota Grande 2018 brings one of such rare cases. Can you imagine to get the mileage of nearly 15 kilometers per liter from a powerful 1798cc machine able to generate the force of 138 horsepower? But Grande 2018 turns it to a reality. Here, with just a single liter of the fuel, you can easily cover the distance of nearly fifteen kilometers. Such an excellent fuel economy also means that your luxury car shall be environment friendly. The minimized CO2 emission, as the vehicle offers, is the needs of the day in the alarming scenario of global warming. 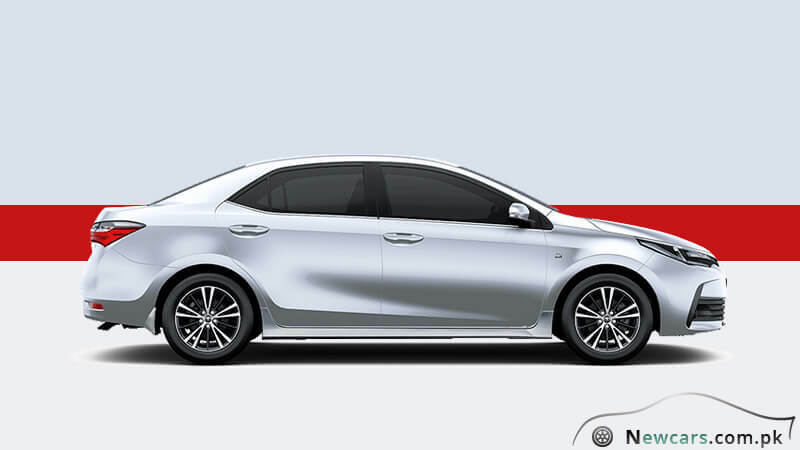 Exuding boldness and prestige, the exterior aerodynamic design of the new Toyota Altis Grande 2018 is meant to give an elegant and superior driving experience. 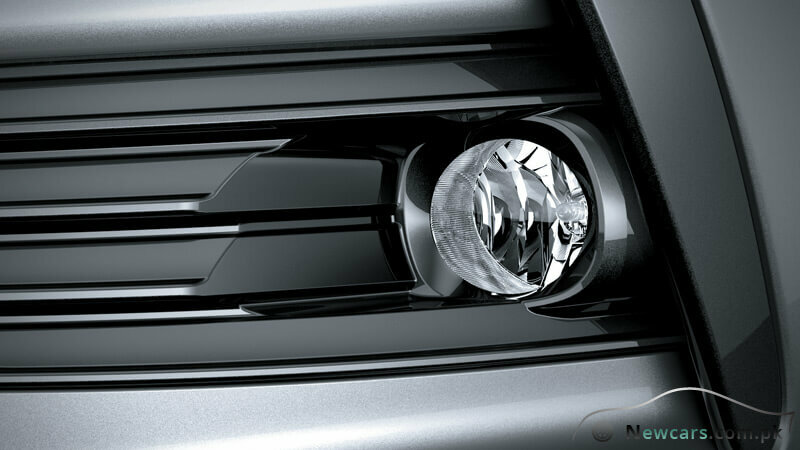 Let’s start from the front where the new headlamp styling along with the LED DRL emanates an air of sleekness. The energy efficient bi-beam LED technology serves to create a daylike visibility in the pitch-dark environment while consuming less power. Fitted to the front, there are round foglamps that accentuate the sharp lines of the car’s anterior. By function, the foglamps will provide excellent visibility in the bad weather conditions. Lending a look to the Side Skirts and Colored Mud Flaps, you will acknowledge they also contribute to an outfitting appearance and style of the car. The trunk opener is powered by a smart touch button. It allows you to unlock the trunk with a touch without taking the smart key out of your pocket. The parking is facilitated through the built-in front and rear-view cameras. You can park the car easily in a small available space as the cameras assist in moving forward or reversing the car. 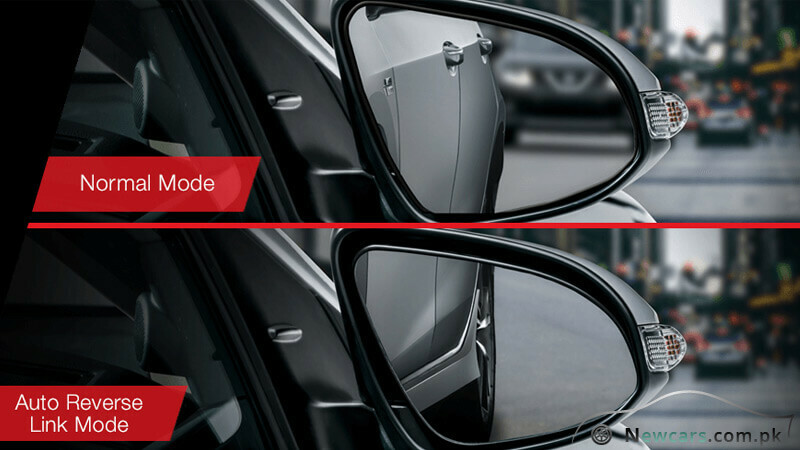 Meanwhile, the Auto Reverse Link Mirror tilts down the mirror angle automatically as you shift the car into reverse. 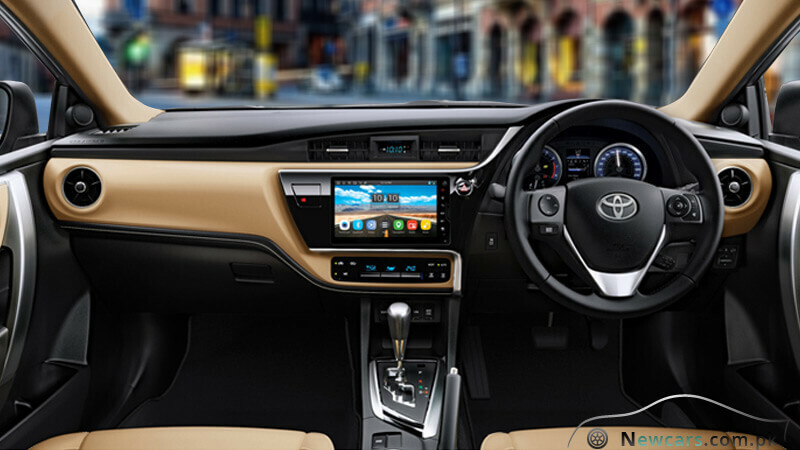 The roomy interior of Altis Grande is full of refinement, grace and luxury. The ample space is not only meant to provide maximum comfort and relaxation to the driver and the passengers but also accommodate a large volume of luggage. To accommodate large items, you have the option to fold down the rear reclining and split folding seats. 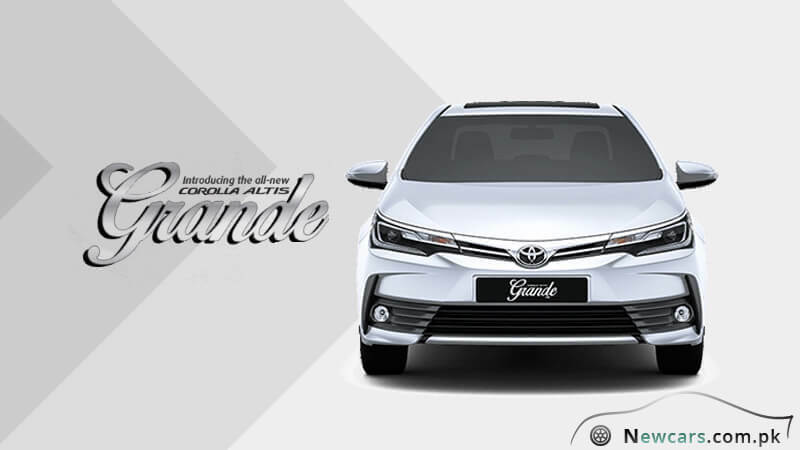 Put against the first-rate luxury traveling features, built into the car, against the Toyota Grande 2018 price in Pakistan, you will realize that the car offers one of the best deals ever. Apart from being powerful, it is sufficiently fuel efficient. It won’t be wrong to call it a faithful travelling companion for family on long tours.